The Ministry of Industry and Trade on May 10 issued a circular detailing Government Decree No. 19/2016/ND-CP on gas trading. According to Circular No. 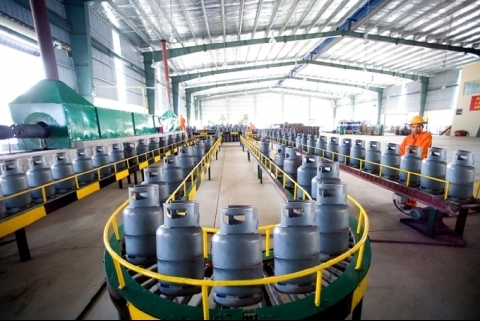 03, wholesalers of liquefied petroleum gas (LPG) may set wholesale and retail prices within the LPG distribution network under their management. LPG retailers must sell LPG at the price set by wholesalers, and receive commissions based on retail prices. Contracts between wholesalers and retailers must be made in writing with a minimum term of 12 months. Regarding registration for importing, exporting and processing gas of special needs, traders must submit their plans for the subsequent year to the Ministry of Industry and Trade prior to October 30 each year. The Ministry will base on such registration to publish on its website a list of traders eligible for importing, exporting and processing gas of special needs. As stated in the Circular, a dossier of request for a certificate must comprise an application for a certificate of eligibility for import or export of LPG, liquefied natural gas (LNG) or compressed natural gas (CNG), a copy of the enterprise registration certificate, a copy of permit for using harbors, and copy of tank ownership or leasing document. An exporter or importer of LPG must also additionally submit a copy of bottling inspection certificate, a copy of the brand license, a copy of the certificate of eligibility for refilling LPG bottles, a list of dealers, and a copy of the certificate of eligibility for supplying LPG. An importer or exporter of LNG or CNG must provide documents on owning or leasing LNG/CNG tanks or pipelines, and copies of certificates of eligibility for supplying LNG or CNG and for refilling LNG or CNG on vehicles.